Happy Christmas Eve! I hope you’re all well and ready for the big day tomorrow. Christmas isn’t always a happy time for people. However, I hope everyone finds peace this festive period. For me, Christmas is a time for family and close friends. The tree is up! The snowman is lighting the way. My dad is making sausage rolls as we speak. The last thing I needed to do is wish my wonderful followers a very Merry Christmas. Also, I wanted to share 5 of my favourite quotes from a range of books for Christmas. Of course, you may have many of your own. Firstly, Song of Years by Bess Streeter Aldrich. This one makes me feel quite warm and fuzzy! Next is one from The Book Thief. This book has me in tears, I can’t deny that fact. This quote reminds me of the joy from simple things. I always find Dr Seuss humorous and fairly accurate. I can’t disagree again with his views on Christmas. Clement Clarke Moore is always quoted. I personally love this poem. I read it every Christmas Eve. My final quote is rather witty and fairly accurate for myself personally. Being as my wrapping paper is covered in it this year as well as last, it seems apt that I leave this till last. Taken from Eloisa James’s Paris in Love. I’m feeling so festive and warm inside. That could be the mulled wine talking! So Merry Christmas my lovelies! I wish you all the very best. Have the most wonderful day. Make some magical memories. Remember those who can’t be sat at our tables this year. Let’s have hearts that are quite full. Happy December! I can’t believe we are 16 days into this month already. I hope you’re working your way through your advent calendars! My life has consisted of work and mock marking as well as the Christmas party last weekend (dare I say more!) This is the first Saturday where I’ve woken up and nothing really needs doing. I can have a slow, restful day. This evening I am off to see A Christmas Carol at the theatre and I truly cannot wait. 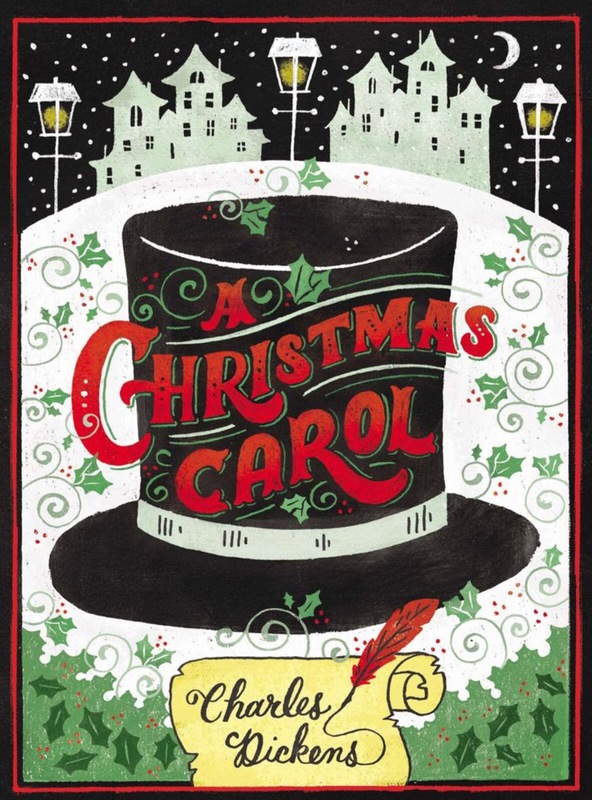 A Christmas Carol is also a GCSE text I’ve been teaching for the past few weeks. This seemed like a big enough sign and opportunity to review this well loved classic. The novel begins on a cold, bleak Christmas Eve in Victorian London. The protagonist, Ebenezer Scrooge, is a miserable, cold and hard character. He loathes Christmas and all those who celebrate it. His cheery, loveable nephew Fred invites him to Christmas dinner. He declines and ridicules Fred for enjoying the festive period. Two charity workers seek a donation to help the poor; Scrooge sends them away, epitomising the attitude of the upper classes of this period. We also meet Bob Cratchit, Scrooge’s clerk, huddled over a tiny fire. He’s very much overworked and underpaid. Scrooge begrudgingly allows him Christmas Day off work, with pay to conform to social custom. Whilst at home that night, Scrooge is visited by Marley’s ghost. The omniscient narrator informs us that he was as ‘dead as a doornail’, he died 7 years prior. Marley’s ghost wanders the earth, imprisoned by heavy chains a money boxes created by a lifetime of greed and selfishness. Marley warns Scrooge that he will be visited by three spirits. This is his one chance to avoid the same fate as Marley. However, his chains would be much longer and heavier. The first sprint to visit Scrooge is the Ghost of Christmas Past. This ghost has long white hair and a smooth face. The ghost is dressed in a white tunic with a branch of holly in his hand. On top of its head is a bright flame. It is here that Scrooge is taken on a journey to his childhood and the events leading to this point in time. Scrooge’s youth showed him a time when he was completely innocent. However, his childhood was a sad one. He was a lonely boy without any friends. He was left at school over the Christmas period. We see a visit from his beloved sister, Fan. Scrooge did have some happiness in his youth. We meet Fezziwig, Scrooge’s first employer, who treated him like his own son. Work finished on Christmas Eve and they celebrated the festivities together. This reminder jolted Scrooge. He seemed shocked to see his former self. Perhaps the saddest part of this stave is when Scrooge sees his former love, Belle. She ends their relationship because he is a changed man; he won’t ever love her as much as he loves money. Scrooge is shown Belle in the future, happily married and with a family. It’s a reminder of what Scrooge could have had. Scrooge is then visited by the second spirit, the Ghost of Christmas Present. This ghost is quite a presence! He’s large but ages as the stave develops. He has long, dark, curly hair and wears a green robe with white fur. Arguably, this spirit is the most impressive. This has to be my absolute favourite stave in the novel. The description is luscious and in abundance. Here we see joyous people preparing for Christmas. The Ghost takes Scrooge to see Fred’s Christmas party where all are having fun and enjoying each other’s company. Most importantly, we are shown Christmas at the Cratchit’s house. Here we meet Tiny Tim, a lovely boy who is a cripple and the apple of Bob’s eye. Despite this, he is a happy child and loves his family greatly. The spirit informs Scrooge that unless the course of events change, then Tiny Tim will die. Christmas here is magical, the food is plenty for their family and they really enjoy their time together. They have little but to them it means the world. These events really shock Scrooge. However, the spirit had not completed his journey. The spirit then shows Scrooge two hideous children: Ignorance and Want. Here Scrooge is given a stark warning, ‘beware them both.’ These children are a clear message from Dickens at the time. They reflect society and the lives of the poor during the Victorian period. The third spirit that visits Scrooge is the Ghost of Christmas Yet To Come. It is this ghost that Scrooge fears the most. This spirit doesn’t speak. It’s dressed in a black cloak with the only feature we can see being his hand. This spirit shows Scrooge a Christmas Day in the future. We are shown scenes of the death of a much disliked man. People seem to be quite happy. Local business men only wish to attend the funeral if a lunch is provided. We see a range of characters steal some of the dead mans possessions ready to sell them on. Scrooge enquirers if anyone was saddened by the death of this mean. The only happiness came from a very poor couple who were in debt to the man. His death meant that this couple would have more time to repay their debt and get their finances in order. The ghost then moves to show the Cratchit’s house. Here the family are mourning the loss of Tiny Tim, echoing the warning from the earlier ghosts. This part of the novel utterly breaks my heart. The final thing the spirit shows Scrooge is a neglected grave. Scrooge realises that this is his own. Sobbing and emotionally drained, Scrooge promises to change his ways to avoid this future. In the final stage, Scrooge wakes up on Christmas Day. He is a reformed and changed man. He decides to see Fred and celebrate the day with him. Naturally Fred accepts him with open arms. He anonymously sends the largest prize turkey to the Cratchit house, giving the boy a crown for doing so. The following day Bob arrives late for work. Scrooge plays a trick on him which makes it seem like he is going to give Bob the sack. What he really does is give Bob a pay rise. He also becomes a second father to Tiny Tim. It is from this point that Scrooge treats everyone kindly, compassionately. He’s clearly learnt from the warnings given throughout the novel. The novel ends with the words of Tiny Tim. This novel is pure magic. Everyone has the opportunity to change, just like Scrooge. Despite being over a hundred years old, this novel still carries the same message today. Dickens wanted society to learn from their mistakes, to see what they were doing to the poor. We have a lot to thank him for. You’ll see that each chapter is written in staves, continuing the musical element from the title. Dickens wanted this to be read aloud. I love teaching it because I feel like I’m doing exactly what Dickens wanted: spreading his message far and wide and embracing Christmas with my whole heart. So, my message is clear: keep on jingling and spreading that Christmas cheer.